Renegade's BS: Big Bang Machine! The sky is falling! Quick, get under a blanket! The world's largest particle collider successfully completed its first major test by firing a beam of protons all the way around a 17-mile tunnel Wednesday in what scientists hope is the next great step to understanding the makeup of the universe. After a series of trial runs, two white dots flashed on a computer screen indicating that the protons had traveled the full length of the $3.8 billion Large Hadron Collider. The startup was eagerly awaited by 9,000 physicists around the world who now have much greater power than ever before to smash the components of atoms together in attempts to see how they are made. The organization, known by its French acronym CERN, fired the protons — a type of subatomic particle — around the tunnel in stages, several miles at a time. Now that the beam has been successfully tested in clockwise direction, CERN plans to send it counterclockwise. Eventually the two beams will be fired in opposite directions with the aim of smashing together protons to see how they are made. "The beam is the size of a human hair," Paola Catapano, a spokeswoman for the host European Organization for Nuclear Research said after the protons were fired into the accelerator below the Swiss-French border at 9:32 a.m. (3:32 a.m. EDT). It'll be months before any usable data comes out from the experiments, but the so-called "Big Bang machine" already has physicists salivating at the prospect of unlocking the mysteries of the universe — and many other people worried it'll create a black hole or strange self-replicating particle that will gobble up the Earth. Professor Stephen Hawking, easily the world's most renowned living physicist, came down squarely in the "it's a good thing" camp Tuesday in a interview with BBC Radio: "Whatever the LHC finds, or fails to find, the results will tell us a lot about the structure of the universe." The researchers' top aim is to find the Higgs boson, a sub-subatomic particle that's essential to the so-called Standard Model of nuclear physics, but which has never been seen. Previously unknown particles are also expected to pop up, if only for a millionth of a second, from the high-energy collisions of protons and antiprotons. A pair of Russian scientists even think the LHC would be the world's first time machine, and that we should expect visitors from the future to arrive soon after it goes into operation. 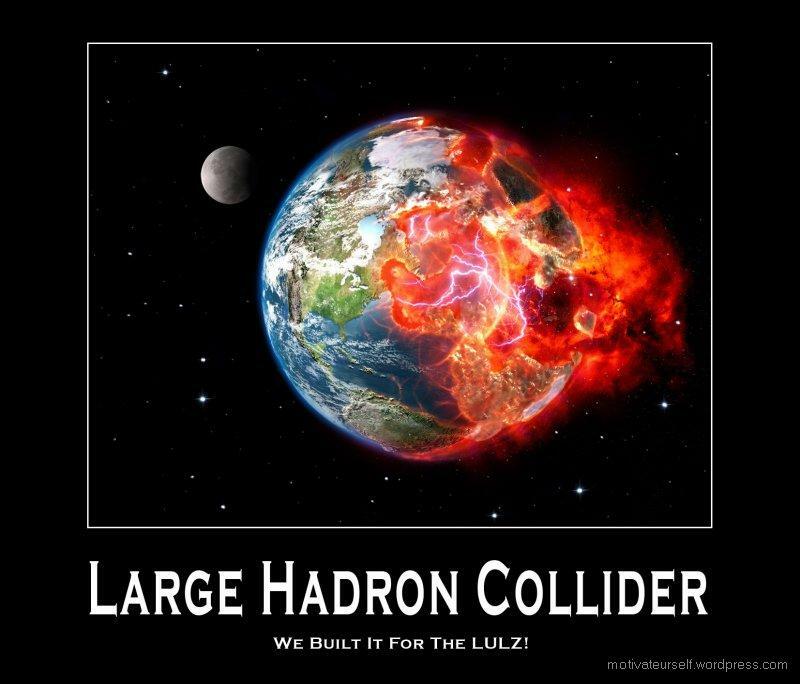 For that, $10 billion dollars has been spent to build the machine, the largest supercollider on Earth ever since the project to build an even larger ring in Texas was canceled in 1993. But the very fact that it would create unknown particles, as well as incredibly dense microscopic black holes that would almost instantly evaporate, has raised many fears. "It's nonsense," CERN chief spokesman James Gillies told the Associated Press. A columnist on Wired magazine's Web site said that "the likelihood of these black holes becoming the more well-known kind of black hole is nearly nonexistent." Brian Cox, a glamorous particle physicist who literally was once a rock star, told London's Daily Telegraph that he and his colleagues had been receiving death threats. He then bluntly characterized anyone who feared the LHC would destroy the world with an unprintable term for a female body part. That hasn't stopped several people, including a former nuclear engineer from Hawaii and a German biochemist, from speaking out against the project. "Someone will spot a light ray coming out of the Indian Ocean during the night and no one will be able to explain it, retired Professor Otto Roessler told London's Mail on Sunday. "Very soon the whole planet will be eaten in a magnificent scenario — if you could watch it from the moon. A Biblical Armageddon. Even cloud and fire will form, as it says in the Bible." "The compression of the two atoms colliding together at nearly light speed will cause an irreversible implosion, forming a miniature version of a giant black hole," reads a lawsuit filed in March in U.S. District Court in Honolulu by Walter L. Wagner and a Spanish colleague, Luis Sancho. The case, in which Wagner and Sancho demand that the LHC stop operations until an independent safety review is conducted, is still pending. Wagner first became famous a decade ago when he filed suit against the opening of the smaller Relativistic Heavy Ion Collider on Long Island, claiming it too would destroy the world when it started up in 2000. Public reaction, true to form, has been mixed. "This reminds me of the Millennium Bug! I love hysteria — it makes me laugh and I need a good laugh," said "Johan of Brisbane" in the comments to an Australian News Corp story. Best of all was the posting on the same page by "KnowerOfAll": "Chuck Norris doesn't look for God Particles — he creates them." Gillies told The Associated Press that the most dangerous thing that could happen would be if a beam of protons at full power were to go out of control, and that would only damage the collider itself and burrow into the rock around the tunnel. Full power is probably a year away. "On Wednesday, we start small," Gillies said. "What we're putting in to start with is one single low-intensity bunch at low energy and we thread that around. We get experience with low-energy things and then we ramp up as we get to know the machine better." Huge amounts of data will pour in — so big that the lab's computers can't sift through it all. So scientists, who will monitor the experiment at above-ground control centers, have devised a way to share the load among dozens of leading computing centers worldwide. The result is the "LHC Grid," a network of 60,000 computers to analyze what happens when protons are hurled at each other. That computing power is needed if scientists are to find what they are looking for among the mountains of data. "You can think of each experiment as a giant digital camera with around 150 million pixels taking snapshots 600 million times a second," said CERN's Ian Bird, who leads the grid project. Sophisticated filters discard all but the most interesting data, still leaving some 15 petabytes to be analyzed. That's enough to fill 2 million DVDs. The data will be sent to 11 top research institutions in Europe, North America and Asia, and from there to a wider network of 150 research facilities around the world for scrutiny by thousands of researchers. Collaborating on such a large project has proved invaluable, said Ruth Pordes, executive director of the Open Science Grid at Fermilab in Chicago. The U.S.-government funded project is among the major contributors to the grid. "We are doing things that are at the boundaries of science," Pordes said. "But the technologies, the methods and the results will be picked up by industry." Even if the LHC experiment doesn't yield answers to the cosmic questions, historians may one day see it as a key step in developing networked computing. It wouldn't be the first time that has happened at CERN. In 1990, young British researcher Tim Berners-Lee created a computer-based system for sharing information with colleagues around the world. He called it the World Wide Web. Now, that's some exciting science! So exciting that it has captured the imaginations of people around the world! Even Google got in on the act! Coincidentally, this was the subject matter at the center of the plot in Dan Brown's Angels and Demons, which will be made into a 2009 movie of the same title! The story is the prequel to The Da Vinci Code, and is very well written... Check it out! Hurricanes Washing Louisiana Life Away!